Move over orange...green is the new color of Halloween. Green Promise offers greener choices for everything from pumpkin carving to Halloween costumes to Trick-or-Treating. This year, make your little goblins green from the inside out. Orange and black aren’t the only colors that deserve a little recognition this time of year. Throwing a little green into your Halloween has never been easier. What a great opportunity to teach your children and the neighborhood kids about the ecological importance of our choices. You will not only be helping the environment by going green this year. By purchasing organic healthy treats and avoiding genetically modified high fructose corn syrup, hydrogenated fat and pesticide-laden candies, you’ll be helping kid’s waistlines too. Americans spend a whopping $950 million on Halloween candy every year. So it’s not surprising that a 2006 Mayo Clinic article estimates that 1 in 3 American children are now considered seriously overweight or at risk of becoming overweight. That’s a staggering 25 million children who are at high risk for high blood pressure, type 2 diabetes, bone and joint problems, exercise induced asthma, disturbed sleep patterns, premature maturity, liver/gallbladder disease and depression. Even if candy corn is your child’s favorite vegetable, it’s never too late to start. Try looking for treats that have the least amount of packaging as possible. Home-made treats are not recommended since most parents will just throw them right into the garbage since there’s no way to be certain that they are safe to eat. Healthy, organic and Fair Trade treats are your goal here. You can find some of the items listed below at health food stores, the organic section of your grocery store or online. Top green Halloween pick: Endangered Species Bug Bites are made with organic-certified, shade-grown, Fair Trade smooth milk chocolate with 52% cocoa content. Or choose dark chocolate squares which are certified vegan, kosher and ethically traded. Along with bite-sized squares of organic chocolate, each piece contains 1 of a set of 32 insect trading cards. $34.52 for 64 pieces at MotherNature.com. Or you can get Halloween packaged Bug Bites in milk or dark chocolate without the trading cards at stores like Whole Foods or you can online direct from Endangerd Species Chocolates at chocolatebar.com. 72 pieces for $18.50 plus shipping. Even if candy corn is your child’s favorite vegetable, it’s never too late to start. Would you like paper or plastic? Now I know you want to know if you should use a plastic bag or a paper bag for trick or treating. Actually, neither! It’s estimated that the United States uses 100 billion plastic bags a year. It would take an estimated 12 million barrels of oil to produce those bags which can take from months to hundreds of years to decompose, all the while polluting lakes, rivers and oceans. Paper bags, surprisingly, are worse. It takes four times as much energy to manufacture a paper bag. Paper sacks generate 70% more air and 50 times more water pollutants than plastic bags. It takes 91% less energy to recycle a pound of plastic than it takes to recycle a pound of paper. So forget about those store-bought cheap plastic or paper Halloween goodie bags that inevitably break every time. Try re-usable bags like a canvas or hemp tote or Limited Edition Halloween Chico Bag which holds up to 20 pounds of Halloween candy. It can be re-used year after year and you’ll love the bright orange background decorated with ghosts, spiders and bats. It’s only $5 plus shipping, so shop now since supplies are limited. If you have joined the new trend in Halloween decorating, make sure to use LED (Light Emitting Diodes) Halloween lights instead of the standard incandescent lights. Doing so will save you 90% on your electric bill, plus they burn brighter, longer (50,000 hours) and cooler (less risk of the kids getting burned). LED light bulbs do not contain toxins like mercury and they are recyclable. You can find a nice selection of Halloween lights at Environmental Lights. Remember, by using LED Halloween lights that you are not only saving money, but you are reducing the need for additional power plants and reducing green house gases. Designing and carving out Jack-o-lanterns are a Halloween tradition that doesn’t need to be abandoned in order to be green. You can certainly find locally grown pesticide free pumpkins by searching localharvest.org by state for a list of local farms or farmer’s markets. If you are carving your pumpkin, you can find free pumpkin carving patterns online saving both cash and gas. For some not-so-free, but very cool pumpkin designs check out pumpkinlady.com and zombiepumpkins.com. Both sites require payment to download their templates, or you can get some great ideas for free by just browsing. For free pumpkin template downloads, try any of the following sites: carvingpumpkins.com, dltk-holidays.com or bhg.com. After you're done carving, try roasting some pumpkin seeds for a healthy delicious snack. Just clean off your seeds, put them in a bowl to coat them with about 1 tablespoon of olive oil and 1⁄2 teaspoon of sea salt per 1 cup of seeds. Spread them on baking sheet in a single layer and slow roast them at 250 degrees for about 45 minutes or until golden brown, stirring occasionally. You can also add other spices like cumin, garlic, paprika or pepper. Slow roasted pumpkin seeds are packed with protein, fiber and are rich in the mineral zinc, which is critical for a healthy immune system. Make sure your little goblins do not litter their candy wrappers while trick-or-treating. They can even bring an extra bag to pick up the litter that other people have made. Saying "Thank you" is always a nice touch and shows just how much you appreciate the time and thoughtfulness of others. After Halloween, any excess candy (I’m sure there will be lots) can be donated to a local charity or church. Oftentimes groups will organize a candy collection and ship the items to orphanages or to our troops overseas for Halloween in November. Making your own costume can be a fun way to use what you have in your house creatively. This is a great way to re-use old items that may not have a purpose any more. When you are done, Halloween costumes also can be donated to charity or handed down to cousins, siblings or neighbors. An exciting and fun idea to raise money for your favorite green charity or animal shelter is to sponsor a haunted house and charge a minimal entrance fee. If you aren’t up to that task, you can collect change while trick-or-treating for UNICEF. This is a great way to use Halloween to teach your children about helping others. The money goes to UNICEF’s worldwide aid programs and there are collection boxes at local Pier 1 Imports and Hallmark Gold Crown stores. For more information see www.unicefusa.org. Putting a little green into your Halloween can be fun way to reduce your footprint on earth, one holiday at a time. 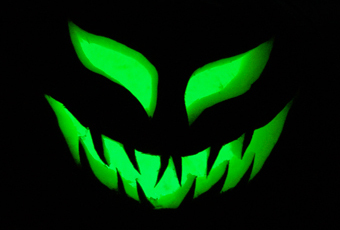 Happy HalloGreen! Sign up to receive our eco-friendly newsletter with tips and resources for a healthy home and sustainable environment. © 2009 GreenPromise.com All rights reserved. Help save the planet by spreading the news about natural and organic products and how to live an organic and green lifestyle. For reprint permission, contact the Green Promise editorial staff at reprints@greenpromise.com.